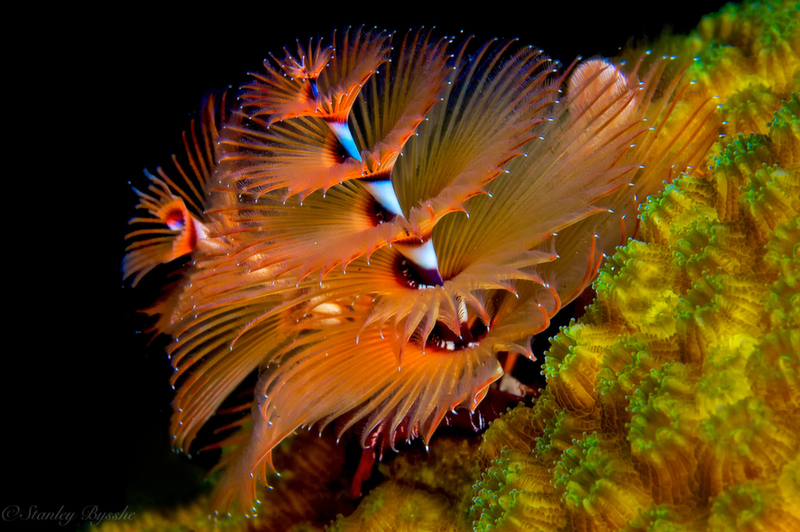 Time for the annual Christmas Tree Worm (Spirobranchus giganteus). This is a tube worm that generally has two heads (crowns) that work as gills and to filter food. Nikon D2x, Aquatica housing, Inon strobes, 105mm macro, 1/125, f11. So cool! And, Merry Christmas to you, too! Nice shot Stan, Merry Christmas to you and all at NSN! Super image and subject - happy holidays! Love these little ones. Excellent image. I really like the dark background. How wonderful! A belated Christmas greeting to you! Love the colorful "tree" with lights, even!